Whether you’re a parent or not, whether you’ve got an empty nest or a full house, whether you work with children or just remember being a child, you know one thing: every child has a lifetime of potential. It takes a village to raise a child to that potential. Every parent wants to give his or her children the necessary tools to grow up strong and successful in the world, but they need support from their community. That’s where nonprofit organizations come in. Knoxville’s nonprofits offer an overwhelming show of support to local families. That support is everywhere. That support is in schools, medical programs, youth sport and leadership and art organizations, and in all the dozens of faith and family-focused nonprofits in Knoxville. And what better way to prove it than by looking at those organizations’ success stories? Joy of Music School, Knoxville Inner City Kids’ Outreach, and Shangri-La Therapeutic Academy of Riding help kids in vastly different ways. One thing that they have in common, however, is that they’ve changed children’s lives for the better. Here are three Knoxville kids organizations achieving excellence. The Knoxville Inner City Kids’ Outreach non-profit (KICKO) goes into Knoxville’s underserved communities and reaches children, the vast majority of whom are not be able to travel elsewhere, where they live—lifting them up and giving them the tools they need to succeed and ultimately to transition to adulthood. The genesis of the organization has multiple points The concept is modeled after a program KICKO’s founders, Bill and Janice Clark, were introduced to at a world evangelization in the late 80s. After hearing a dynamic speaker on an another inner city program elsewhere, Janice felt she should go back to school to study missions. She did, and by the early 90s, KICKO was up and running in two of Knoxville’s neighborhoods that were most notorious for gang violence. This is their mission: to reach kids who are “left behind” by other programs and to meet them “in their neighborhoods,” as current director Michael Clark says. In an age of video games and instant messaging, KICKO builds lifelong interpersonal connections. One of those connections is a multi-generational legacy. Jourdan Elder-Richardson, who made her first Knoxville friends as a child at KICKO’s activities, now brings her son Malachi to the organization’s meetings every week. “I was one of their students, one of the kids that they welcomed into their ministry,” she says. Jourdan, then only 8 years old, was a recent transplant to Knoxville. Awakened one day by loud music, she left her house to see colors, games, and–most of all–other kids. Years later, when she had a child of her own, Jourdan saw a face from her past: Bill Clark, the founder of KICKO. 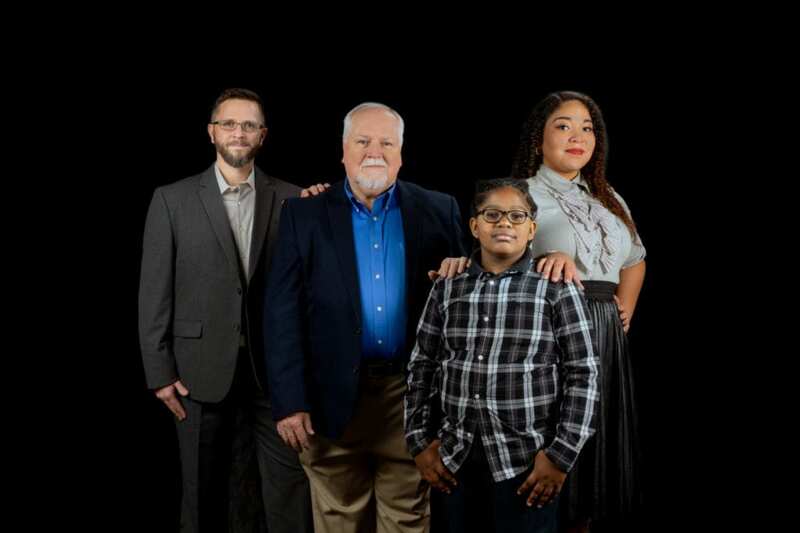 From left to right: Michael Clark (current director of KICKO), Bill Clark (founder of KICKO), and Jourdan Elder-Richardson stand behind Malachi (10). The memories all came flooding back. Bill invited Jourdan to bring her child to a KICKO meeting, where another generation was dancing, singing, and learning. Immediately, Jourdan’s son Malachi fell in love with the organization. While he enjoys meeting new kids and dancing, his favorite activities are the games. Through memory games, kids learn Bible verses with the goal of applying the lessons to their lives. Like many kids his age, Malachi has some electronic pastimes. But more and more, he spends time playing football and basketball and bouncing on the trampoline. He thinks that KICKO’s active, outdoor enthusiasm has helped him and other kids be healthier. “You get fresh air,” he says wisely. For many kids, music is pure joy. At Joy of Music School, over 100 local musicians encourage and nurture that joy by giving free private lessons. Through Joy of Music School, kids are able to learn, grow, and challenge themselves without the often-prohibitive cost of private lessons. Since 2013, Caleb and Chloe Weaver have been a weekly presence at the school. The twins, who are now high school seniors, say that the organization made huge experiences possible in their lives. While both Weavers had taken piano lessons since age five, the duo branched out into different instruments with the aid of their instructors. Caleb took up bass guitar, while Chloe found her rhythm in drums. With the school’s help and their own passion and energy for music, the twins soared to great musical heights. In the summer of 2018, they each won full-ride scholarships to a five-week program at Berkeley College’s School of Music. “It was only possible through Joy of Music,” Caleb says. More than anything, the Weaver twins feel that music is an important mental and emotional outlet. “If a kid takes up a musical instrument and he likes it, then that means he has an outlet and he can connect with other people through it; he can do whatever he wants with it,” Caleb says. At Shangri-La Therapeutic Academy of Riding (STAR), lessons aren’t just about riding. It’s about learning and strengthening skills that will serve special-needs students all their lives. Through weekly therapeutic riding, kids and seniors with physical, mental, or neurological disabilities can improve in diverse areas–some of them unexpected. Jackson Miller is the most cheerful 12-year-old in the world. He’s also one of the hundreds of students who learn in unexpected ways at STAR. Before coming to STAR with Jackson, Jennie had only a vague idea of what sort of special needs the program served. “I don’t think I understood the diversity of struggles riders have,” she says, explaining that STAR served everyone from deaf students to disabled veterans. In fact, when STAR put on its annual summer show, Jackson won third place in the obstacle course. He had come a long way–equine obstacle courses would be difficult even for a 12-year-old without spatial awareness issues.